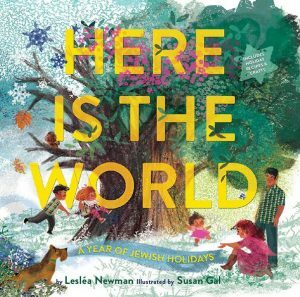 Here Is The World is a celebration of a year of Jewish holidays, told in rhyming couplets with great joy. Come join the fun as the shofar is sounded for Rosh Hashanah, a sukkah is built for Sukkot, the menorah is lit for Chanukah, a grogger is shaken for Purim, and on through the rest of the year. To augment the story, the book contains an explanation for each holiday as well as a corresponding simple craft or recipe. I have always loved the Jewish holidays and they were a big part of my childhood. I loved to light the menorah for Chanukah, look for the afikomen during the Passover seder, walk to the synagogue on Rosh Hashanah and Yom Kippur with my parents and two brothers. I wanted to write a book that captures all the joys of the Jewish holidays, which I continue to celebrate year after year after year. 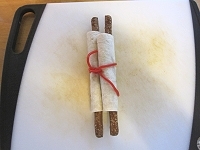 An edible Torah made from a tortilla, almond butter, chocolate sprinkles and pretzel rods, tied with a licorice string. Read the Butler’s Pantry review on their blog. “The year’s range of Jewish holidays and celebrations are presented in this repeating, rhyming chant that features key succinct elements for each. ‘Here are your parents, with arms open wide. / Here are your siblings, to stand by your side.’ Beginning in early fall, Newman carefully chooses a new baby girl’s naming ceremony, not usually represented in other literature, followed by a Shabbat candle lighting, dinner and visit to the synagogue. She then launches into the high holy days of Rosh Hashanah, Yom Kippur, Sukkot and Simchat Torah. Winter leads with Hanukkah, followed by Tu B’Shevat and Purim before the traditional spring celebrations of Passover and Shavuot. An early summer Shabbat picnic brings the year full circle. Bookending this annual list with Shabbat observances reflects the significance the Sabbath holds in Judaism.